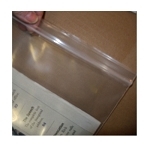 These large 16x24" bags are heavy weight yet they are archival and uncoated. They make a wonderful enclosure for newspapers (folded position) and large projects such as scrapbook materials and children's artwork projects. They are heavy enough to hold books and notebooks. Other ideas for use: collecting your Time Capsule items; Book Storage; Classroom storage; Artwork holding and storage; Tool storage; Holding bags for any project that you need proper storage or organization and you cannot do that immediately; seasonal clothing storage. 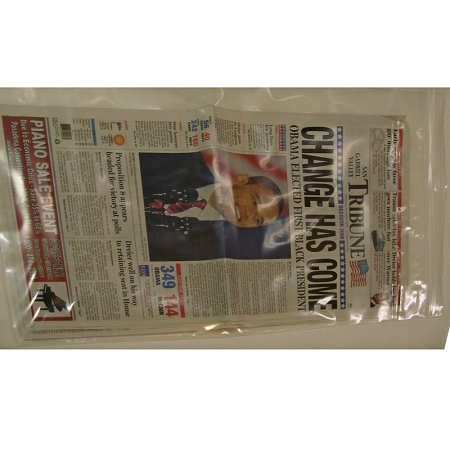 This 16x24" Poly Zip Seal Newspaper Pouch 4 mil Clear Envelope is water resistant, thick, and completely inert. Size is 16"x24", zips along the 16" side. 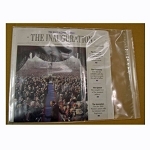 It nicely fits most older aged (civil war, etc) newspapers flat (in reading position) up to 15.5"x23.5".